I used to feel lucky to have spent most of my working years within walking distance of Gwanghwamun, the geographical and political center of South Korea. That satisfaction fades when I pass by the main square of Seoul these days, as it turns from a forum for democracy into a political junkyard. The route from City Hall Plaza and Deoksu Palace to Insa-dong via Gwanghwamun Square had been my favorite walking route. On any fine day, I would walk northeast with the gentle backdrop of Samgaksan embracing the Blue House and Gyeongbok Palace under the blue sky. One day last week, I started my solo trip from the Seosomun exit of City Hall Station on Subway Line No. 2, braving a cold spell that sent the mercury below minus 10 degrees Celsius with strong winds. Receiving me on the ground was a black-and-white placard mourning the death of Kim Yong-gyun, a nonregular worker at the Taean Thermal Power Plant. It was inviting the public to take part in a memorial event at Gwanghwamun Square for the young man, who died earlier in December on a conveyor belt carrying coal. “Stop subcontracting dangerous work! Kill no more nonregular workers!” said the banner. About 50 meters away was a memorial altar for Army Lt. Gen. Lee Jae-su, the former chief of the Defense Security Command, who committed suicide a few weeks before while under investigation by the prosecution in connection with his organization’s alleged surveillance of the families of the victims of the Sewol Ferry sinking. Walking past the table full of white chrysanthemums along the 1.5-kilometer route toward my Insa-dong destination, I passed by at least 10 protest sites established for public and private causes, each delivering gruesome messages, some accompanied by loud, combative music. Perhaps because of the extreme cold, not many protesters were out that day, but a few could be seen inside small tents on the sidewalk. Further up, there was another altar for the late three-star general at the southwestern corner of Gwanghwamun Square. “Patriotic” representatives of the Korea Military Academy alumni association and some civilian groups called on citizens to rise up against “the treacherous government of Moon Jae-in,” which they claim is leading the nation toward a total security collapse. It was ironic that Gen. Lee in the black-framed picture was looking directly at the 4-year-old altar installed in the middle of the square to commemorate the 304 people who died in the Sewol Ferry incident. Candles were burning and police officers were standing guard in front of the tents, which were turning gray as a result of pollution, but no visitors could be seen in the tents or outside them. While I was remembering the five passengers still missing -- Danwon High School class 2-6 students Nam Hyeon-cheol and Bak Yeong-min, their teacher Yang Seung-jin, Gwon Jae-geun and his little son Hyeok-gyu -- I pondered the meaning of President Moon’s message in the visitors’ book at a southern seaside altar for the victims. “Boys … I thank you,” he had written there. At the main entrances to the Gyobo Life Insurance and Korea Telecom buildings, union members were demanding the reinstatement of laid-off workers and acceptance of their conditions in the collective bargaining processes at those companies. Few protesters were seen, but their signs and placards formed disorderly fences around the large offices. Then I spotted a group of young men and women who were brave enough to sit on the icy sidewalk by the US Embassy, listening to a leader who was talking about welcoming Kim Jong-un on his forthcoming visit to Seoul. The leader also spoke of the need to “dismantle” the US Forces in Korea, declare an end to the Korean War and conclude a peace treaty between the US and North Korea. Uniformed police trotted about the embassy building nonchalantly -- the group must have been a constant presence there. I walked up the backstreet to the Japanese Embassy, where the survivors of Japanese military sexual slavery during World War II, called “comfort women,” were condemning the past evil on a weekly basis and gathering around a bronze statue. Someone had wrapped the figure of the young girl in a wool scarf and blanket, but the place was quiet because it was not a Wednesday. The weekly demonstrations have been held there every Wednesday for the past 27 years. Finally, entering the Insa-dong road of traditional souvenir shops and eateries, my mind recovered a little bit of peace from the aimless anger that the endless protests had caused me. But my thoughts went back to the night of Dec. 19, 2012, when Park Geun-hye celebrated her election victory in a rally at Gwanghwamun Square. She was in power for four years before being ousted after months of weekend demonstrations at the same place. Gwanghwamun gives power and takes it back in our short history of democracy, which dates back to the day when blood was spilled at Gwanghwamun Square in the April 19 Student Uprising of 1960. The disorderliness at Gwanghwamun today attests to the degradation of democracy in Korea, despite how much we have boasted to the world of having achieved a free democracy and a free-market economy in such a short time. As another New Year dawns, more gloom than hope is seen in the faces of Koreans, who are beginning to lose confidence about their future. Until Gwanghwamun is saved from politics and returned to peace-yearning citizens, Korean democracy will keep on limping. Those in power today should help in this process before their tenure passes the halfway point, after which it will be too late to turn the tide, as history reveals. 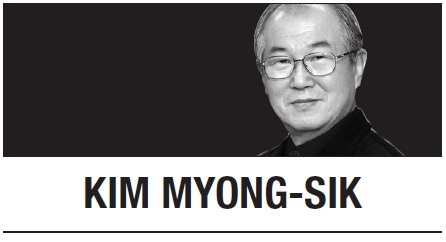 Extraordinary wisdom, tolerance and restraint are required of President Moon and his associates, who have wasted so much time in past-oriented politics and reckless economic experiments. In Korean politics, two years is long enough for the regrouping of opposition forces to present an effective challenge to the incumbent. No advice can help unless the top leader realizes this reality.